Cakes by no more tiers, York. Spreading a little happiness through the medium of cake! Formerly a Corporate Lawyer for more than 10 years, I was bitten by the sugarcraft bug in Summer 2009 and haven’t looked back since! 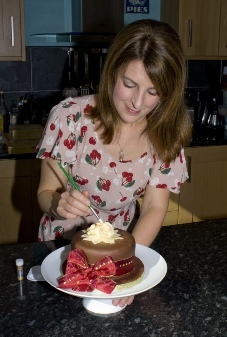 What started as a hobby quickly became an all-consuming passion, and in March 2012 I finally left the legal world behind to focus on all things cake. I enjoy working in all sorts of sugarcraft disciplines, from novelty through modern contemporary designs to classic floral work. I am learning all the time and am always hungry to try something new, so my work is constantly evolving! I have won prizes for my work at both national and regional level and my cakes have appeared in magazines, newspapers and cake blogs. My kitchen has been inspected to the satisfaction of the local council and I hold the relevant food hygiene qualification. I am also an active member of the British Sugarcraft Guild. Part of the enjoyment of my work is the diversity of requests – I have had all sorts of briefs to work with, please browse through my photos to see the various themes that I have covered so far, or contact me to give me a new challenge! Sugarcraft is my passion - it makes me happy to be able to bring the “wow factor” to your celebrations, and I look forward to sharing some of that happiness with you!